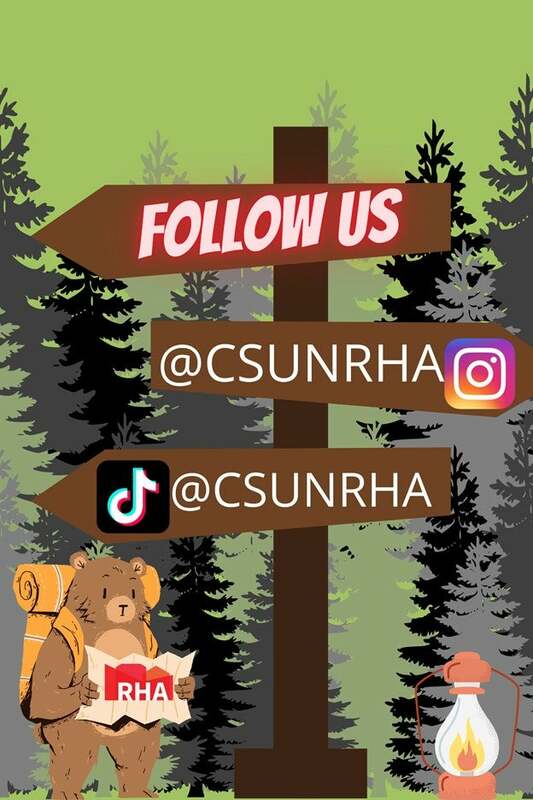 The Residence Halls Association (RHA) is an organization with the goal of promoting a healthy academic and social environment while serving as the student voice for concerns of the community in CSUN Student Housing. RHA provides engaging programs for students to get involved, and hosts regular community meetings to discuss concerns and suggestions. RHA Executive Board is the leadership team that manages all aspects of the association. These individuals are responsible for planning large events, collaborating with Park Council Directors to create strategies to remedy student concerns and manage administrative duties as assigned. Hi, My name is Perla Leyva, and I’m a fourth-year, Speech Pathology major here at CSUN. I want to give back to my community by opening a practice in my hometown. I’m from Lamont, California and my favorite thing about it is all the huge farming fields, and because of that I have always loved cows and decorating. Especially decorating with cows! Hello, I’m Jesse Hernandez the new Training and Recruitment Manager for CSUN Residence Halls Association. I am a fourth year Philosophy major, and I want to pursue a career in immigration law. Growing up in North Hollywood, California, I always liked the reminder of the valleys and hills in my hometown. Some of my favorite things are mainly sweaters and dinosaurs; or even better a dinosaur on a sweater! Hello, I’m Arlenn Galvan, and I’m the new Finance Manager for RHA. I am a third-year student here at California State University, Northridge. I’m majoring in Early Child Development, and my goal is to work with kids. I love frosted sugar cookies and blankets, but most of all sports especially soccer. I’m from Hayward, California in the Bay Area and the diversity, culture, and people will always be my favorite thing about my hometown. Hi, my name is John Krossa or J.T. and I am from San Luis Obispo, California. I am the Program Manager for RHA. I am majoring in Film and, my dream is to work in the entertainment industry and work on new upcoming films. Besides movies, I enjoy Sour Patches, Guitars, and cars. In my quiet hometown spending time with my golden retrievers will always be a reminder of home. Hey, I’m Leeza Jackson, the Marketing and Media Manager for RHA. I am a second year CSUN student and I’m majoring in Journalism. I plan on working in politics and helping legal campaigns. I’m from San Diego, California and I always loved the beautiful beach sunsets from back home. I also enjoy Hot Cheetos, cats and sunglasses! Hello, my name is Alex Gallardo, and I’m a third-year student here at CSUN. I am a Communication Studies major, and I intend on working in the event planning field. I grew up in Lancaster, and in my community the outdoors and quietness is a staple that always reminds me of home. When I am indoors, I enjoy dogs and watching Game of Thrones. Here at RHA, I am the Operations Manager, and I’m excited to meet new people this year! Hello! My name is Chelsea Morin and I am the Assistant Coordinator for Residential Student Engagement. I received my Bachelors of Arts in International Studies from the University of La Verne in 2014 and my Masters of Science in College Counseling and Student Development from Azusa Pacific University in 2017. I have been a proud member of the Matador family since 2016 and am excited to continue to work with CSUN students. As someone who started their Higher Education career in RHA, I can say that I am excited to work and serve students as the RHA Advisor.My fun fact is that I have always had a passion for the arts and enjoy practicing and performing music in my spare time. RHA works to respond to concerns that students may have while living in CSUN Student housing. Our Park Council Directors engage with the communities they represent to voice concerns coming from other housing residents. RHA also has a platform for submitting anonymous or non-anonymous suggestions for housing leadership. To submit feedback, please visit the RHA Resident Feedback form at http://tinyurl.com/csunrhafeedback. Once this feedback is received, your Park Council Directors and Executive Board members will develop plans to respond to student concerns. What is the RHA Fee? This one-time annual fee is charged to all CSUN Student Housing residents and it is established to partially fund the Residence Halls Association (RHA). 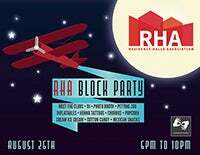 RHA is essentially your student governing board in housing that promotes student advocacy and plans engaging events for residents to enjoy. Your $15.00 goes a long way! Not only do we plan the largest-scale events in Student Housing, but we also work to respond to resident concerns within the residential experience. If you are looking to opt out of the RHA Fee, please fill out the inquiry form at http://tinyurl.com/csunrhafee. Once you have completed the form, please allow 2 business days to process your request. GREAT ESCAPE- Battle of the Bands: This is an opportunity for incoming students to get to know who is RHA. Residents are welcome to join RHA in an ultimate lip sync battle in our battle of the bands competition. There will be small snacks as well as few props for your band. 3rd Annual Block Party: It’s move-in day! RHA welcomes all our residents to our housing community and to experience first hand who and what RHA is all about. This is also an opportunity for our residents to engage with campus clubs and organizations while enjoying fun activities that RHA has brought to housing. This includes vendors such as airbrushed tattoos, a tie-dye station, and fun foods to eat. Welcome Week: Welcome week is a series of events throughout the first week to provide all our residents with a fun welcoming to the new school year. As RHA, provide a space to make all our residents feel welcomed here at CSUN; give them a home away from home. In addition, this will be an opportunity to show our residents that living in housing can be enjoyable. MataSplash: this is the first event of welcome week. It’s hot out and there is nothing more refreshing than going out and enjoying the pool in the bright, California sunshine with inflatables provided by RHA in pool. We also have various activities planned such as watermelon eating contest, giant jenga, bubble art, and some cold treats for our residents. MataShine: It is the residents’ time to shine! Many of our residents display many wonderful talents and this will be a space where our residents are encouraged to express themselves. For residents who do not want to take part in the open mic, there will be an arts and craft section so they can have the same opportunity to express themselves, but in a different way. Furthermore, a pasta bar will be offered to our students with various choices of pastas, sauces, and toppings to choose from. MataGames: Score for the Matadors! Inflatables are always fun and interactive. From making a homerun, to a touchdown, to shooting some hoops on our sports inflatables. Also featured, will be a pony derby race where residents hop on ponies and hop their way onto the finish line. Lastly, come on and enjoy the interactive human foosball and score some goals with your fellow teammates. MataRoyale: Cha-Ching! Take your chance and roll the dice. Come experience the joy of playing BlackJack, poker or even Roulette. RHA is hosting a night of luck where everyone gets to take a chance and play the game. Prizes and fun is all up to be won during RHA MataRoyale. Octerror: Come and join RHA into the mysterious horrors of a haunted mobile truck. All you need to enter is to donate a food item or pay $5. The more items you donate, the higher your chances are of winning a raffle prize from RHA. Furthermore, come out and enjoy the spooky crafts we will be having and see if you can make it out of maze before time runs out. cRHAm- 90s Night: It is about that time… Finals are quickly approaching, leading to stressful times. Come and join RHA and relax from the stress of finals in our stress relief event. RHA will be hosting a 90s night with roller skating and and will feature popular 90s arcade games. Come relief yourself from stress as well as get prepared for finals with our test supply table where there will be free supplies to prepare you for finals from scantrons, to pencils, to highlighters and flashcards. Welcome Back: It’s the Wild West: Winter break is over and the start of a new semester has begun. RHA wants to welcome you all back to a new spring semester with a swinging start. 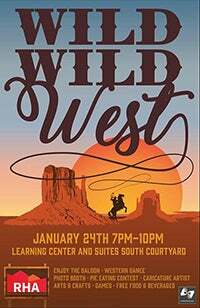 At our Wild West event come join RHA in a milking cow contest, pie eating contest, while enjoying delicious Western style barbecue. Take a ride on the mechanical bull or enjoy petting animals in our petting zoo. Spread the Love: Love is in the air and so is RHA! Join RHA and indulge in making a gram for your friend or loved one. Have a friend or loved one? Join University Counseling Services and enjoy our mock weddings all while enjoying delicious and chocolatey treats. You can also make a teddy bear at our teddy bear session or make your own mini heart shaped pizza. Housing Staff Appreciation Brunch: Our Staff works hard to keep CSUN student housing well and alive. Join RHA with a brunch dedicated to our amazing housing staff. A varied popular of brunch items will be served along with a small surprise for our staff. 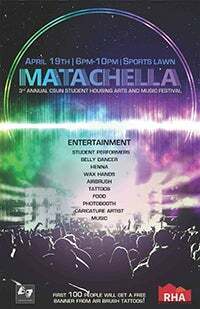 Matachella: A music and arts festival for students who are interested in showcasing their talents during performance hours. Students will also enjoy a various of activities from roller skating to henna followed with fun foods such as funnel cakes. 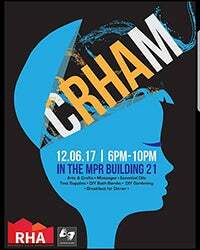 cRHAm: RHA’s last event. It is that time of the year once again…. Finals are approaching for spring semester and RHA knows how stressful it may be. Join RHA for a quick and fun study break and enjoy the wonderful crafts we have instore for you as well as enjoy 15 minute massages from the Muscle Whisperer. Community Outreach: RHA loves bringing enjoyment to housing, but we also care about our residents concerns and make our best efforts alongside other departments of housing, to give everyone the opportunity to have a successful year. 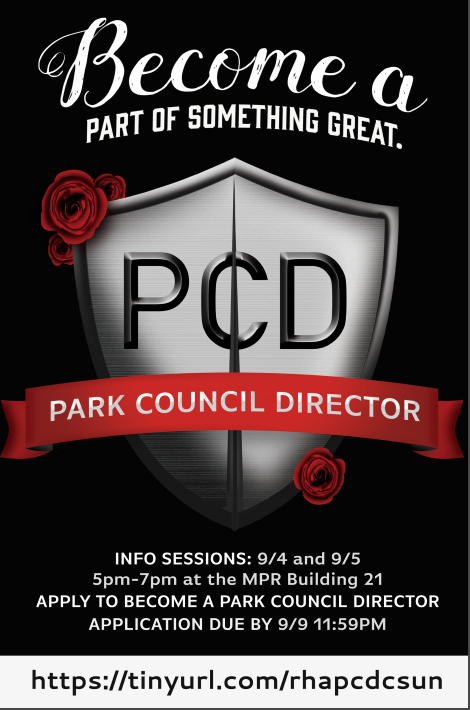 Our monthly community outreach will be hosted on the suites courtyard between buildings 16 and 17 where students can meet both Exec Board and their Park Representatives known as Park Council Directors (PCD) and voice their concerns through our updated student feedback form on google forms. This is a great opportunity to interact firsthand with all RHA members while at the same time enjoying small activities, snacks, and a chance to win some cool prizes. RHA welcomes all our residents to our housing community and to experience first hand who and what RHA is all about. This event is also an opportunity for our residents to engage with campus clubs and organizations while enjoying fun activities that RHA has brought to housing. This includes vendors such as airbrushed tattoos, a tie-dye station, and fun foods to eat. Welcome week is a series of events throughout the first week to provide all our residents with a fun welcoming to the new school year. As RHA, provides a space to make all our residents feel welcomed here at CSUN we wanted to bring the community together to show that Cal State Northridge will be their home away from home. In addition, this event gave students the opportunity to show our residents that living in housing can be enjoyable. cRHAm gave students the opportunity to relief some stress as we all prepared for finals. RHA provided students with free supplies to prepare you for finals from scantrons, to pencils, to highlighters and flashcards. At our Wild West event, RHA planned a milking cow contest, pie eating contest, while enjoying delicious Western style barbecue. Students were able to take a ride on the mechanical bull or enjoyed petting animals in our petting zoo. Love is in the air and so is RHA! Students joined RHA as they indulged in making a gram for their friends or loved ones. Students were able to join University Counseling Services and enjoy our mock weddings all while enjoying delicious and chocolatey treats and heart shaped pizza.